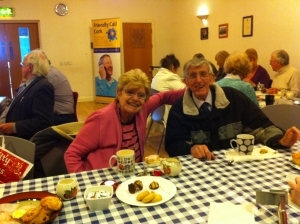 Friendly Call Afternoon Tea – May 2014 » Comhar Chathair Chorcai Teo, Cork City Partnership Ltd.
Our May Friendly Call Afternoon Tea was a tremendous success. The afternoon kicked off just after 2pm, when clients started to trickle in to the Hut in Gurranabraher. Many were collected from their doors by volunteers. We started off with tea and cakes; both clients and volunteers alike had a good natter, face-to-face, which is a change to our daily telephone calls. After countless cups of tea and cakes, we had a singsong led by volunteer Ronnie Morley and his trusted guitar. Over 30 clients and 8 volunteers attended on the day; the singing talent was of a very high standard in the group. We recognise that a number of our clients really appreciate a social outlet; the Afternoon Tea Event enables a client to come along to an event and to meet people in a similar situation in a relaxed environment. A sincere thank you to Neil Prenderville, RED FM for his generosity in sending up the beautiful cakes and scones from Brackens Bakery. All our Friendly Call Clients were truly delighted with this gesture.